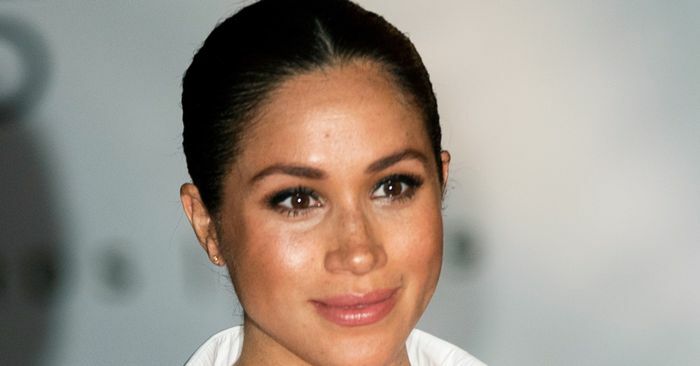 Given her acting background, Meghan Markle is certainly no stranger to the red carpet, so it should come as no surprise that she knows exactly what to wear for such an occasion. The Duke and Duchess of Sussex attended the Endeavor Fund Awards in London on Thursday night and Markle nixed a traditional red carpet gown in favor of a crisp white button-up shirt and a maxi skirt, both custom pieces by her go-to brand, Givenchy. The look reminded us of one of Carolyn Bessette Kennedy’s iconic outfits from 1999—and you know we always love a ’90s homage. A white button-up is arguably the #1 workwear staple everyone should own, but Markle managed to make it look glam with the addition of metallic Aquazzura heels and a strategic slitted skirt to add just the right amount of sultriness for a night out. Her slicked-back hair and Givenchy clutch also made the office item look anything but boring. Scroll down to see the expectant mom’s new red carpet outfit and shop a similar look.